A plan to double the width of the bicycle lanes on Princes Bridge by removing two lanes of car traffic has been given a major boost after VicRoads approved the idea. The plan now needs to be approved by Melbourne City Council, which has already set aside $150,000 for the project in its current budget. A Melbourne City Council spokeswoman said this was the final approval required before the plan went ahead. Princes Bridge is one of the worst spots in Melbourne for crashes between vehicles and cyclists. There were 17 crashes between 2008 and 2010, according to VicRoads data, the most of any place in the CBD. 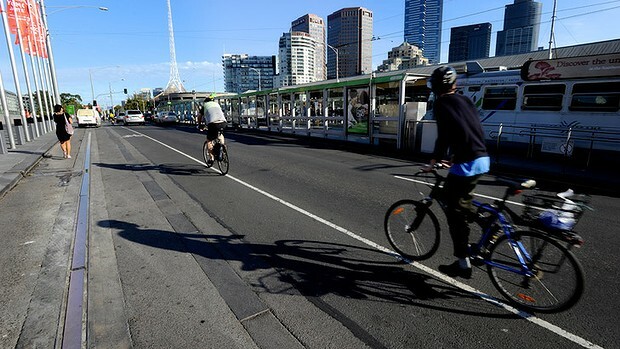 The City of Melbourne's 2012-16 bicycle plan states that earlier changes aimed at making the bridge safer for cyclists had been ineffective. "Changes to the alignment of the bicycle lane, green pavement treatment and early start bicycle lanterns have not made a material difference to safety at this busy location," the plan says. The current plan includes installing rumble strips between the bike lane and the car lane across the bridge.